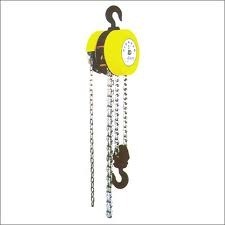 We manufacture our Chain Pulley Blocks from high grade raw materials, these manual chain hoists are easy to operate. These Chain Pulley blocks that are widely used for pulling, lifting and lowering in various industries such as Automobile, Construction and Textile. The chain pulley block offered by us are made using finest quality of the raw material and are incorporated with the helical super gear train and are provided with no bush system. These are widely known for their sturdy construction, stability, load bearing capacity and operational efficiency. Our blocks are sourced from reliable vendors in the market and are offered in different specifications to fulfill the diverse requirements of all our clients. Established in 1983, we possess tremendous knowledge to manufacture and wholesale a broad range of Industrial Gears and Handling Equipment. The product range includes Industrial Gears, Gear Boxes, Material Handling Equipment, Roller Chains, Pulleys, Couplings, Sprockets and Steel Wire Ropes. Our range of products is widely used in several industrial applications due to their compact designs, reliability, long functional life and reasonable prices. The robust infrastructure allows us to manufacture an excellent range of products, which gives high performance. Besides, our highly knowledgeable quality auditors conduct stringent tests on this range, based on parameters like corrosion resistance, design and many more. We have also set-up a spacious warehousing and packaging unit, that facilitates correct and easy loading & unloading of the products. Furthermore, we offer the facility to pack these products as per our clients' requirement, using wooden crates and corrugated boxes.